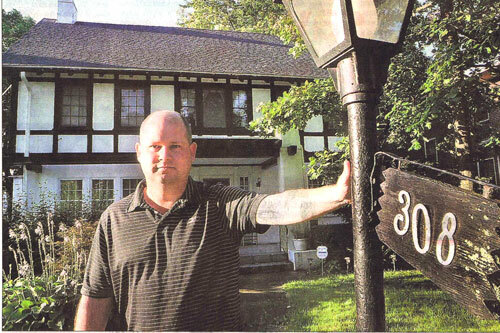 Patrick Beckel stands in front of the house he nearly had stolen from him by a con man, who essentially tricked him into thinking he had sold it to the man. Staff photo by Bill Lackey. By the time owner found out the papers he signed to close a deal were phony and he still owned the house, foreclosure proceedings had begun. SPRINGFIELD – A few months after Patrick Beckel put his house on the market in 2006, someone bought it. Or at least he thought someone did. What he didn't know at the time was that the documents he signed to close the deal were phony, and that Dumond Henderson, the straight-laced, seemingly reliable young man who made the offer on his house, was a con man. According to Beckel and court records, after Henderson moved into the house at 308 E. Cassilly Street, he never paid a dime for it. And technically he didn't have to, because he never actually owned it. “We got nailed,” Beckel said. Since the deal was bogus, Beckel put the house backup for sale and then sold it again—this time for real. In June, Henderson was sentenced by U.S. District Court to 24 months imprisonment for defrauding a mortgage lender, Lime Financial, out of more than $130,000 during the 55-day period when he lived in the house." Beckel doesn't know why, if he had all that money, he didn't make a single payment. “It would have taken a lot longer for all of this to come out if he had just paid the loan or paid us,” Beckel said. When Henderson supposedly purchased the home, he convinced Beckel he had obtained a mortgage loan, and that the lender was going to wire the funds to pay off Beckel's outstanding home loan on the property. Homeowner duped in mortgage scam - Buyer used a fake title agency and a mortgage obtained with an assumed identity to get a house. SPRINGFIELD – It was a respectable home: Built in 1911, it had four bedrooms, two full baths, a rooftop deck and an elevator. A big part of why Patrick Beckel decided to buy the house at 308 E. Cassilly St. was because he thought the elevator would make getting to the second floor a lot easier for his father, who had Parkinson's disease. Four years later, in 2006, after his father died, Beckel put the house on the market. It turned out to be a bad year to sell a house, though, even one with an elevator. A national housing boom had ended. Home prices had already peaked nationally and the FBI was warning that dodgy lending practices — the same ones that would be responsible for the housing sector meltdown — were leading to epidemic levels of loan fraud. The young man from Middletown who made an offer on Beckel's house, Dumond Henderson, was just one of many getting in on the action. The 27-year-old's scheme was a case study in mortgage fraud. By the time the Secret Service pieced it together, Henderson had duped Beckel out of his house, taken another man’s identity and bilked a wholesale subprime lender out of $131,000. In 2007 Henderson pleaded guilty to a federal wire fraud charge. Last June – the same month he turned 30 – he was sentenced in United States District Court to a two year prison term. Currently he is serving a 10-month sentence in a state penitentiary on an unrelated forgery charge. Today Beckel remembers him as a warm person, unfailingly polite. He called men. “Sir” women “ma'am.” Beckel said that he and his wife liked him right away. Even so, when Henderson and a title officer showed up to Beckel's Cincinnati office to close the deal, Beckel was unsure. Henderson had made a $125,000 offer on his home, but they didn't have a check, just closing papers. Henderson explained to Beckel that he had obtained a mortgage loan, and that the lender would wire the funds needed to pay off Beckel's outstanding balance on the property. But Beckel had misgivings about the amount of paperwork: just two sheets. He wasn't a real estate agent, but he thought selling a house required more paper. He called his agent, and she assured him that everything was in order. So Beckel signed the papers and handed over his house: keys. It was a “dry-closing,” meaning that, though closing documents were signed, no money changed hands. What Beckel didn't know was that the title agency handling the closing, Ultimate Resource Group, was fake, court records show. Henderson had set it up himself. The person posing as the title agent was just a friend of his. Three days after the phony closing, Henderson moved into the house. Despite what he had told Beckel, he hadn't obtained a loan by then. But it wasn't for a lack of trying. loan when it was discovered that the money was to be transferred not to a title agency, but directly to a personal bank account in his name. It was only after he had moved into Beckel's house that he got a loan. And then it wasn't in his name, but in the name of a 19-year-old friend, Keith Channels. Unlike Henderson, Channels had good credit. Using Channels' identity and Beckel's house as collateral, Henderson secured a loan of $131,000 from an Oregon-based lender called Lime Financial. He had the lender wire the funds to the account of his fake title agency, court records show. Approximately $26,000 of the loan went to a bank account in Channels' name, according to court records. During the investigation that followed, it was seized by the Secret Service, which investigates crimes associated with financial institutions. “Presumably, he allowed (Henderson) to use his identifiers in return for some of the money from this scam,” said assistant U.S. attorney Laura Clemmens, who prosecuted the case. This was the federal wirefraud charge on which both Henderson and Channels were eventually convicted. Neither was charged with mortgage fraud. For allowing Henderson to use his identity, Channels was convicted earlier this year on one count of conspiracy to commit wire fraud in United States District Court and was sentenced to three years probation. He declined to be interviewed for this story. Henderson spent just 55 days in Beckel's house, but Beckel says that during that time he devastated it. He tore out the carpet, ruining floorboards; he had a tree service remove trees from the yard. The elevator – the reason Beckel originally bought the house — was removed. Beckel thinks he sold it for scrap. Though Henderson had received a home loan, albeit through fraudulent means, he did not pay any of the money toward Beckel's outstanding balance. And during that time, Beckel said that the bank that serviced his home loan, Union Savings Bank, was sending past-due bills and late notices to the Cassilly Street house, where he no longer lived. Beckel only learned he still owned the house when a Springfield tree service puta lien on the house for unpaid bills. Then the bank began foreclosure proceedings. Ultimately, Beckel was able to stop the foreclosure by making good on the payments, but the foreclosure remains on his credit history, even after the Secret Service sent the bank a letter explaining the fraud. To get Henderson out of the house, Beckel had to evict him. Repairs to the house to fix Henderson's renovations cost him around $36,000. When Beckel finally sold the house in 2007 – this time for real – he did so for $127,900. He maintains that the whole ordeal, besides leaving a black mark on his credit history where his mortgage used to be, ultimately cost him tens of thousands of dollars. According to Henderson's attorney, L. Patrick Mulligan, restitution for all parties is still pending before the court. Mulligan maintains that the lender, Lime Financial, is almost as much to blame as Henderson and Channels for the wire-fraud. Lime Financial apparently neglected to do a title check on the house, according to records. When it looked as though the loan would go bad, the lender didn't sell the house; it sold the loan — at a $30,000 loss. The lender that bought it, C-Bass, didn't do a title check either, Mulligan said. Today both lenders want their money back, plus fees and interest. But Henderson hadn't obtained a loan. The money was never wired. Beckel's bank began sending him past-due bills and late notices to the house – a house in which Beckel no longer lived. Investigators later told Beckel that Henderson simply put them in a drawer. By the time Beckel realized he still owned the house, his bank had begun foreclosure proceedings.